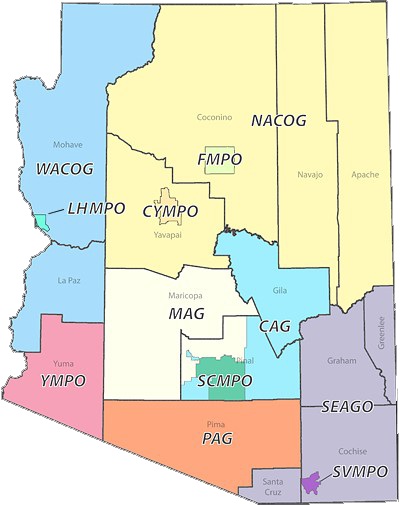 Transportation & Transit planning activities are provided through Western Arizona Council of Governments (WACOG) for La Paz & Mohave Counties; and, their incorporated communities. La Paz County incorporated communities include the Town of Parker and the Town of Quartzsite as well as the Colorado River Indian Tribe. Mohave County incorporated communities include Bullhead City, City of Kingman, Lake Havasu City, Colorado City as well as the Chemehuevi Indian Tribe, Hualapai Indian Tribe and the Kaibab-Paiute Indian Tribe. WACOG’s Transportation Planning Department assist member entities and Native American Tribes within La Paz and Mohave Counties in securing funding opportunities for transportation related infrastructure and planning projects. Involved in virtually every aspect of western Arizona’s transportation needs for our local members, WACOG also provides coordinated planning and technical assistance for, highway and local roadway improvement, population data collection and projections, regional and local transit studies and coordination efforts between all transit programs throughout the region.